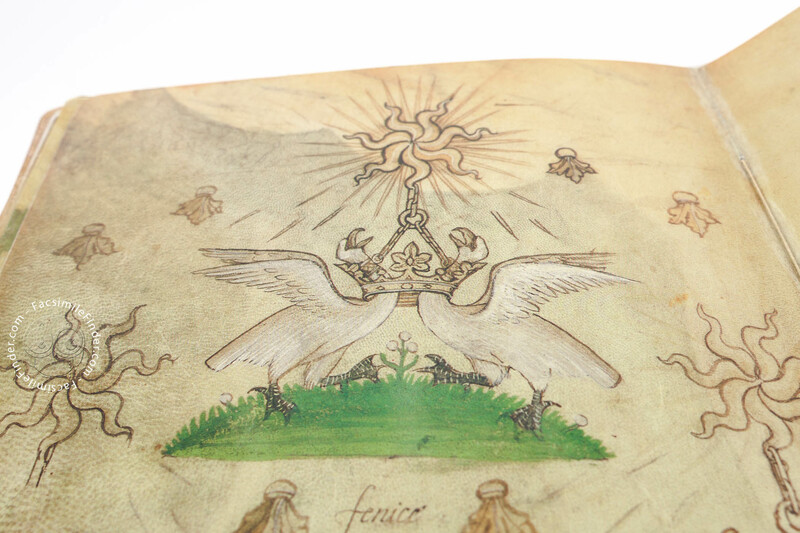 The Model Book of Giovannino de Grassi is the best known and most precious manuscript in the "Angelo Mai" Library in Bergamo and is commonly regarded as the most important example of late Italian Gothic art. 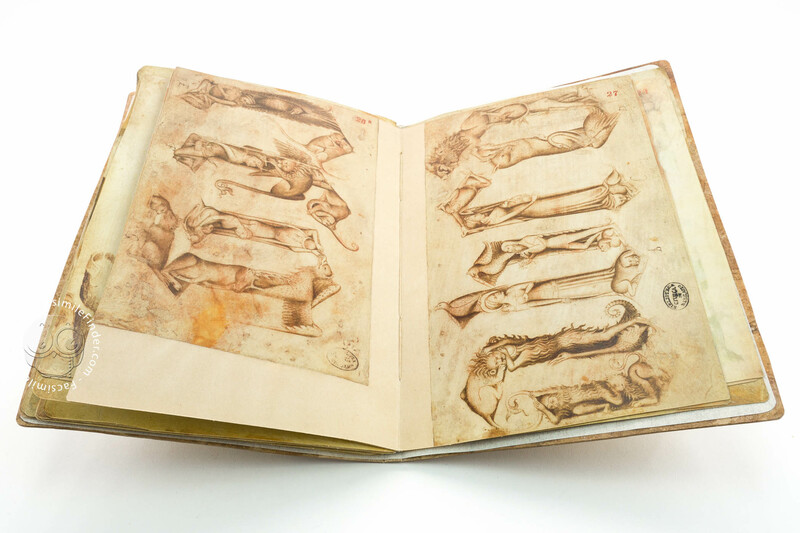 Created in the late 14th century at the Visconti court, the codex, a so-called model book, comprises 77 drawings and 24 letters of the alphabet in excellent quality. 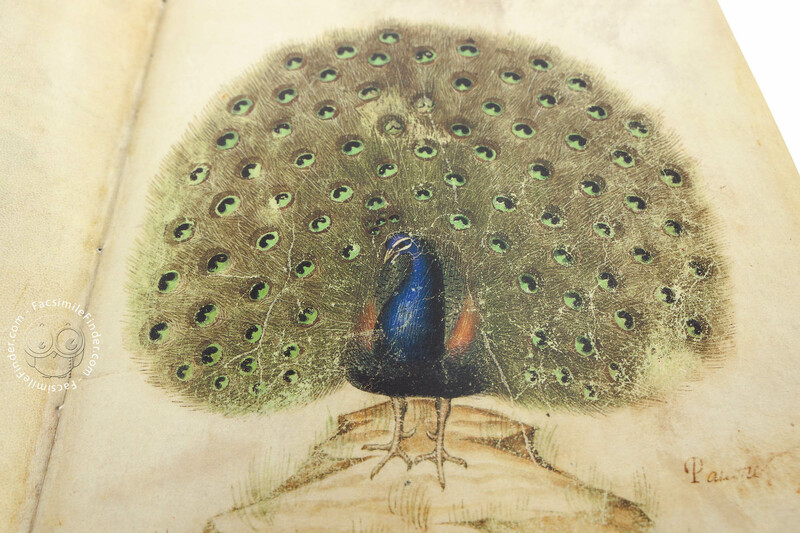 The master who so perfectly painted the manuscript is Giovannino de Grassi. 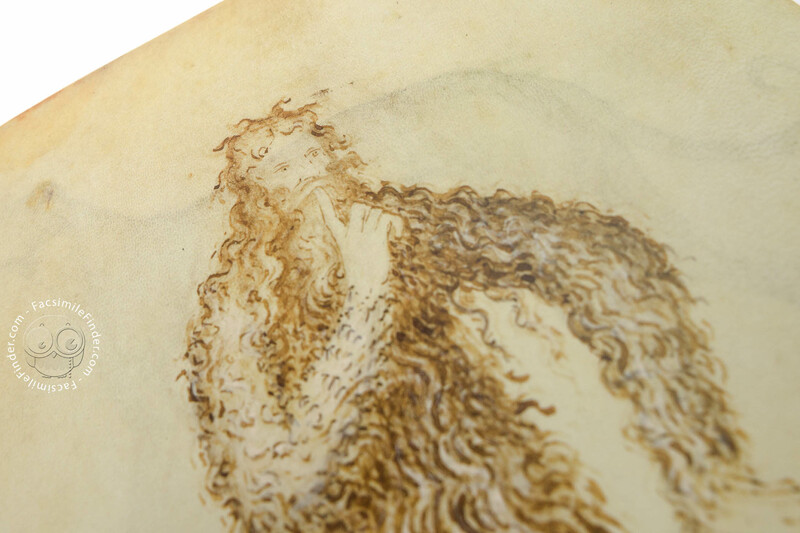 He was truly a universal artist and a gifted drawer and sculptor as well as the architect of the cathedral in Milan. 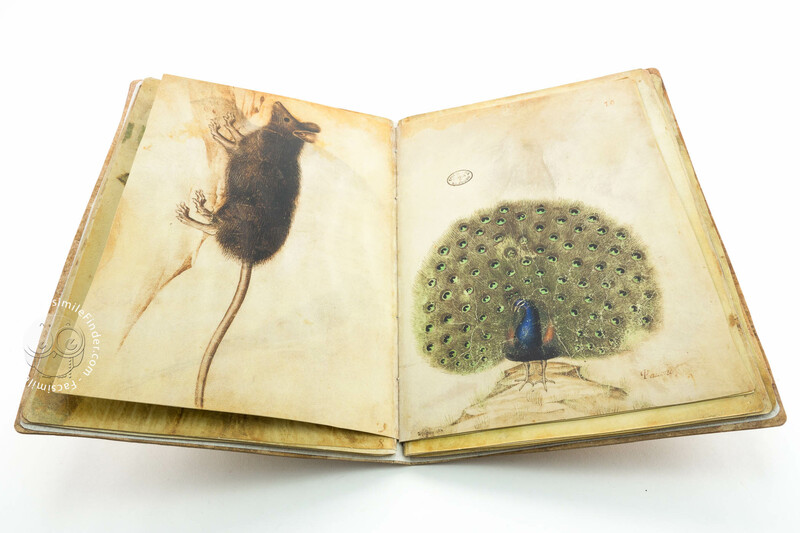 At the height of his career Giovannino de Grassi maintained contact with the most famous architects of the central European Gothic cathedrals, including with Heinrich Parler and Ulrich von Einsingen. 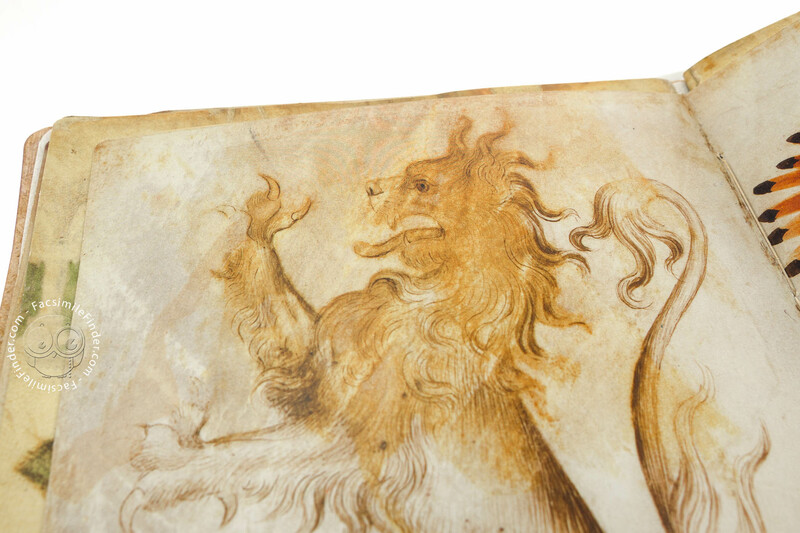 This reinforced the Lombardian master’s position and probably also led him to produce drawings in which he documented his artistic ideas. 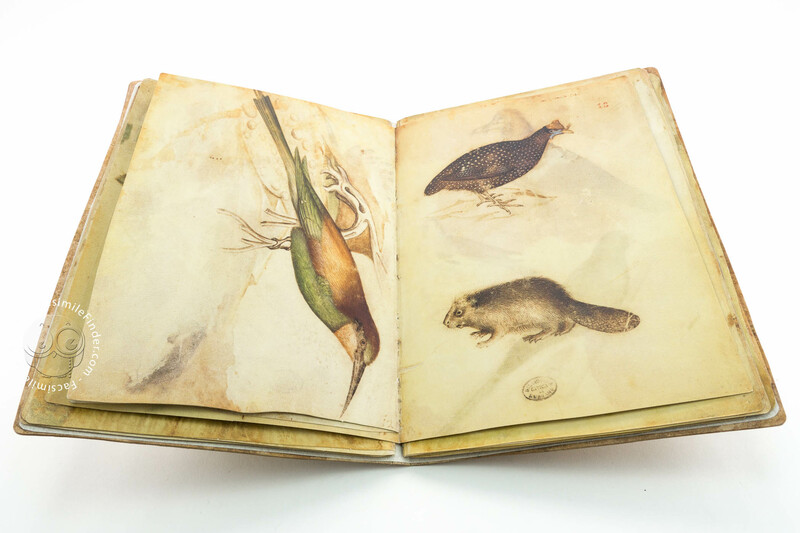 Model books of this kind used to be an indispensable aid in every artist’s workshop. 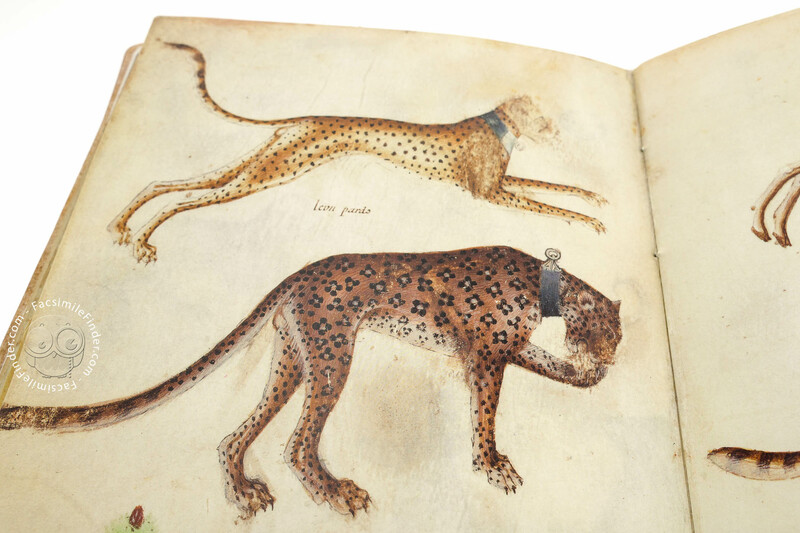 They contained artful ornamental elements, perfect calligraphic initials and even animals, since most medieval artists never had the opportunity to study exotic creatures, such as leopards, gazelles or even lions, in nature. 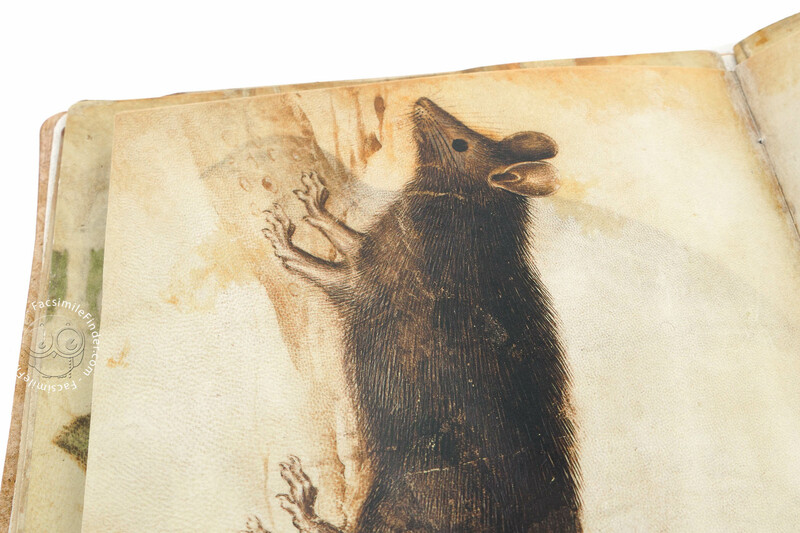 In order to depict these animals in a realistic way, it was necessary to provide the artist with a model which could be identified without question by the viewer. 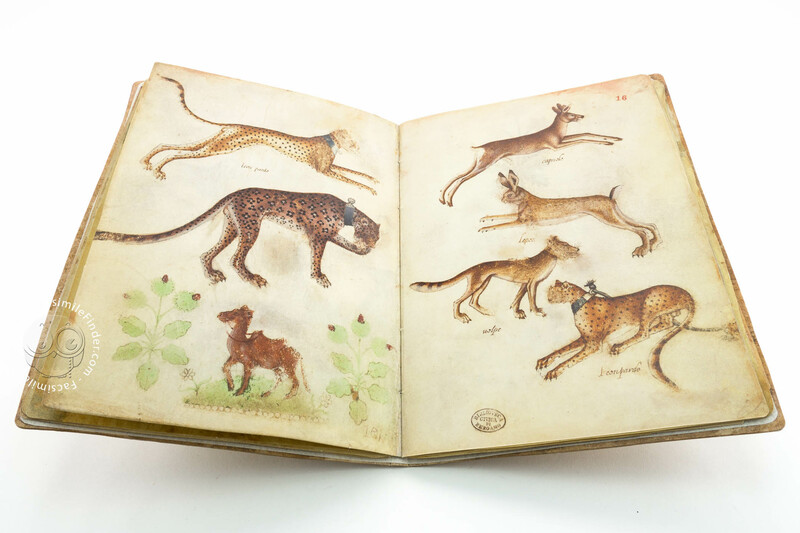 Model books thus provided exemplary motives, showing both human beings and animals in their typical pose or executing specific activities. 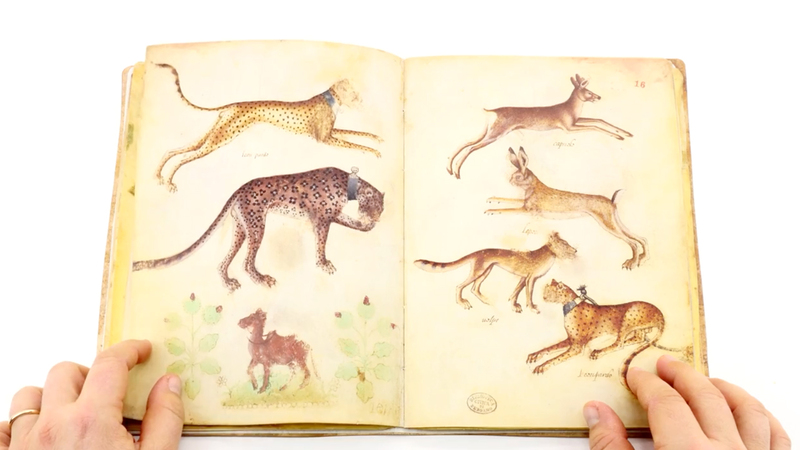 The model book depicts the most varied types of creatures. 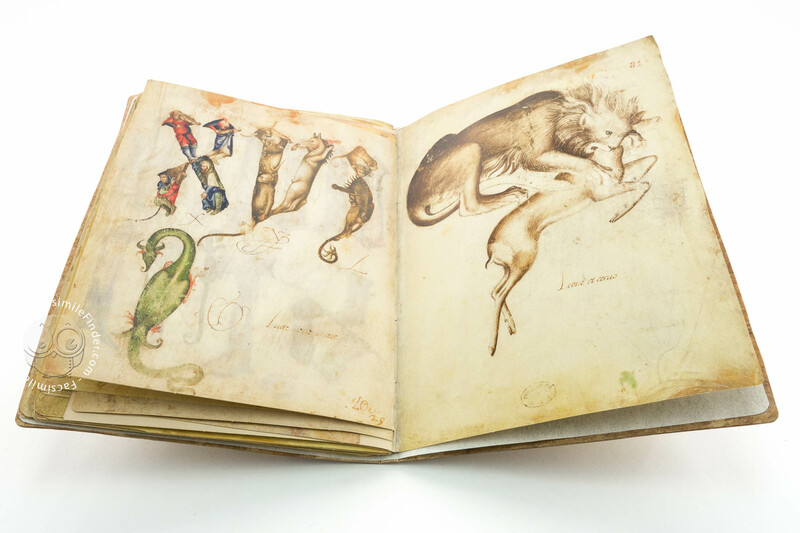 Sheeps and lions rest harmoniously side by side while ostriches, porcupine, and monkeys happily roam among the pages of the manuscript. 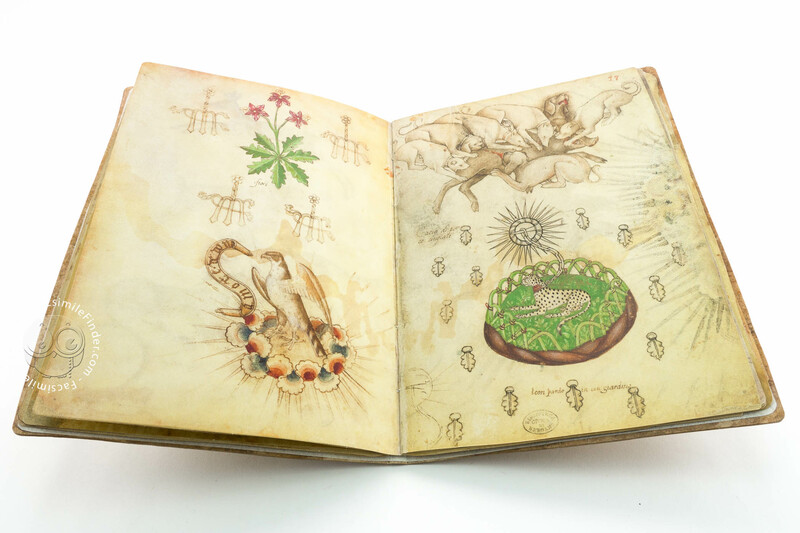 A very interesting feature is the perfectly drawn groups of humans. 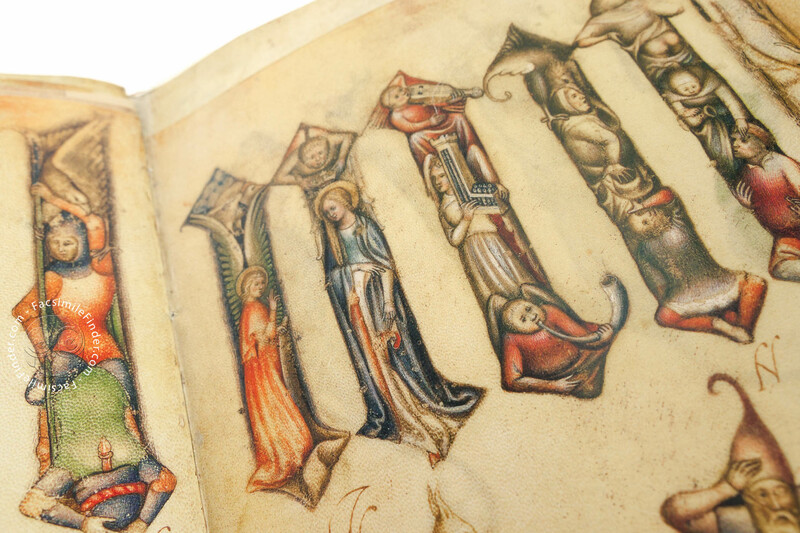 There are women playing the lyre or gathering to read. 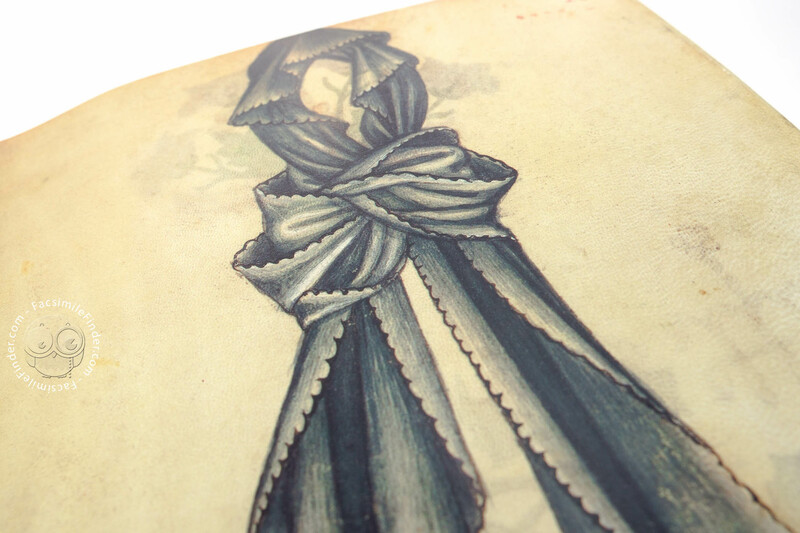 There is even a sailing boat. 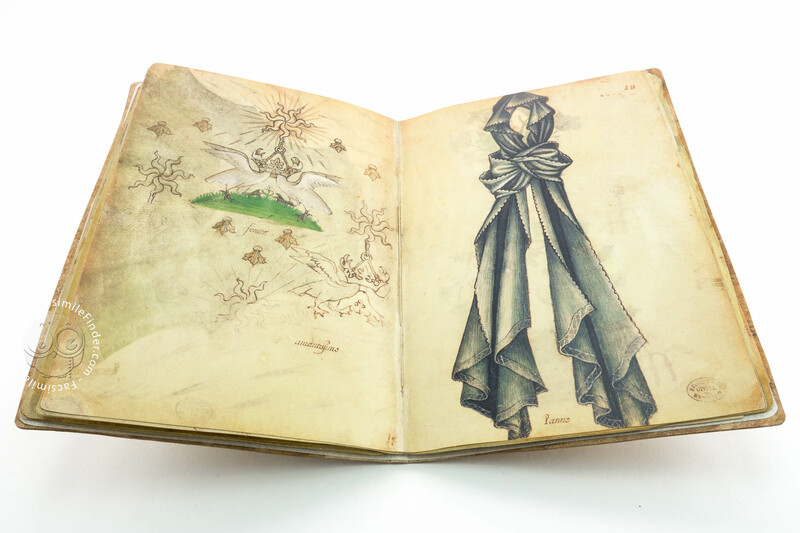 Every single page of the model book is a work of art in its own right, so masterly executed that many painters after Grassi used it as a model for their own creations. The five most extraordinary pages of the model book contain Giovannino de Grassi’s famous alphabet. 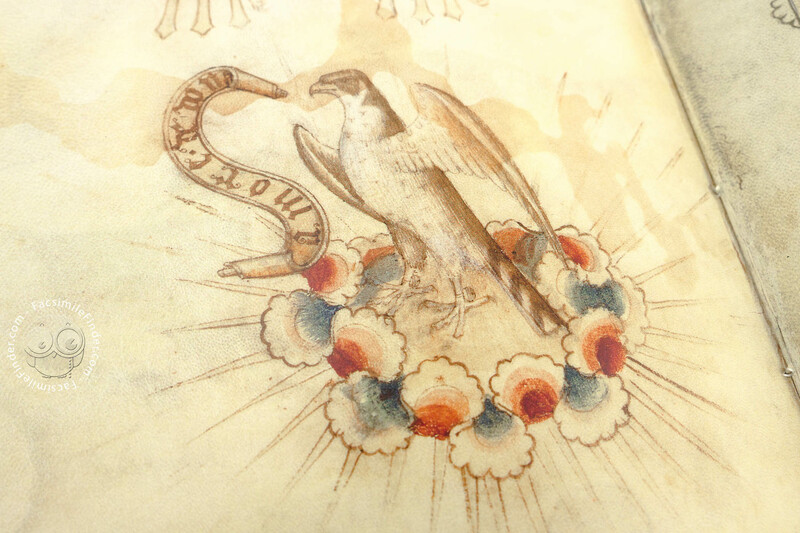 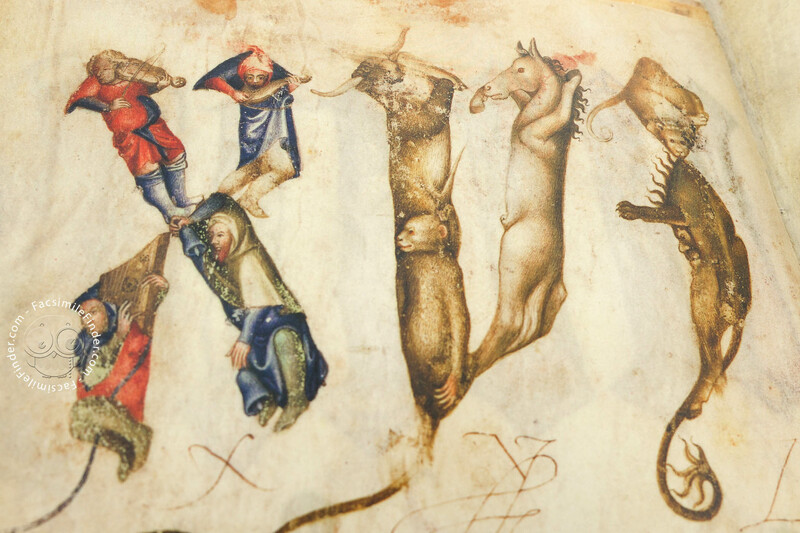 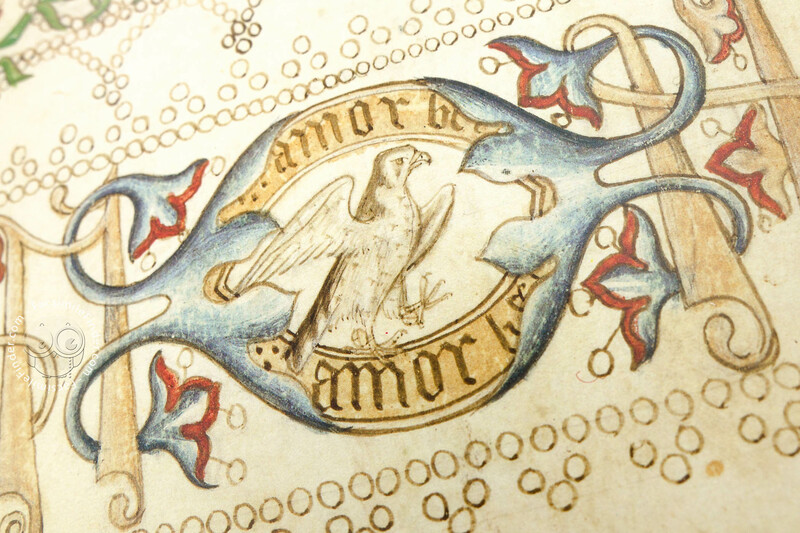 The Gothic letters, so skilfully painted by the master himself, consist of both human and animal figures. 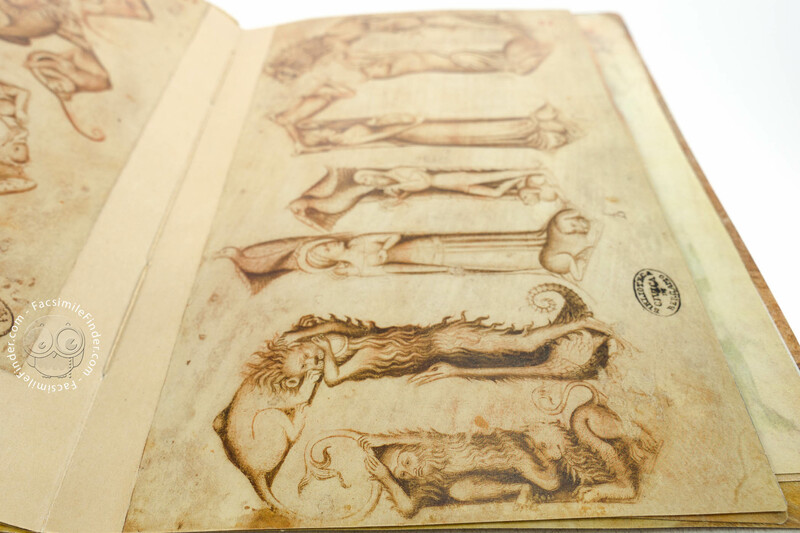 Musicians and angels wander through the book, side by side with very realistically sketched lions or bulls. 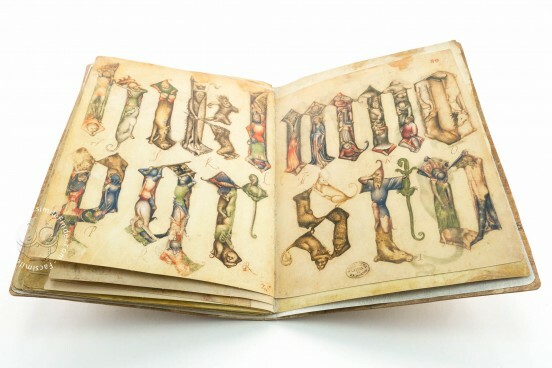 Given their extraordinary artistic importance and the great influence they would have on the stylistic evolution of art, model books soon became sought after as collector’s items. 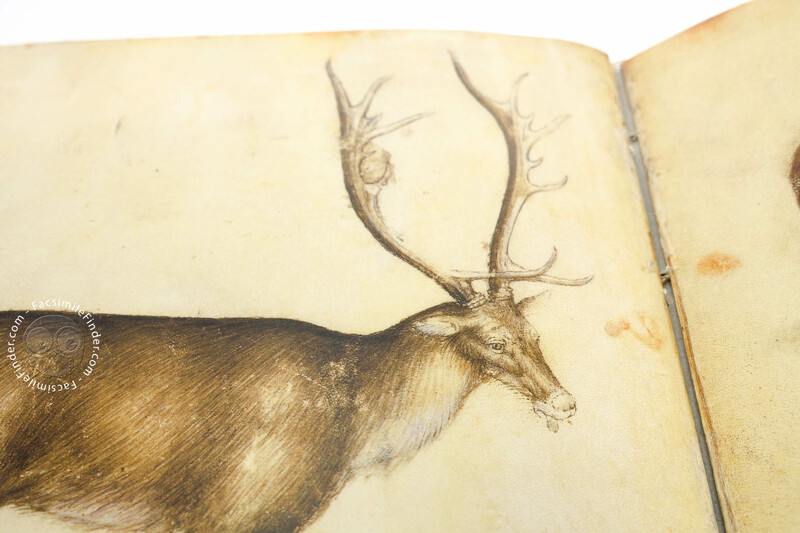 The most famous and most important of all is undoubtedly our sketch book by Giovannino de Grassi, particularly due to the uniqueness of its pictures, each of which represents a coherent work of art in its own right. 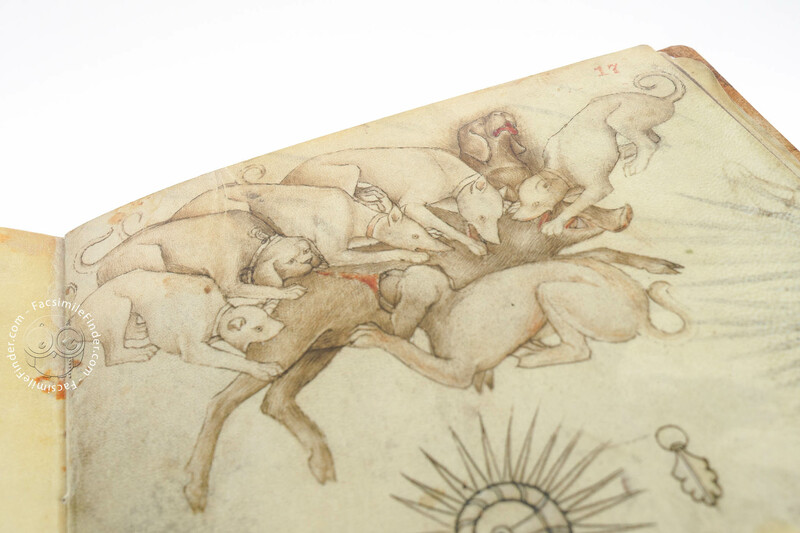 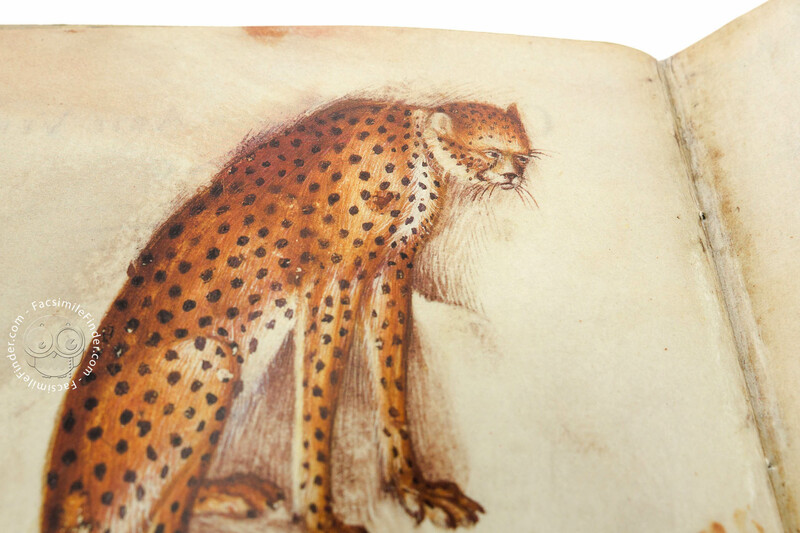 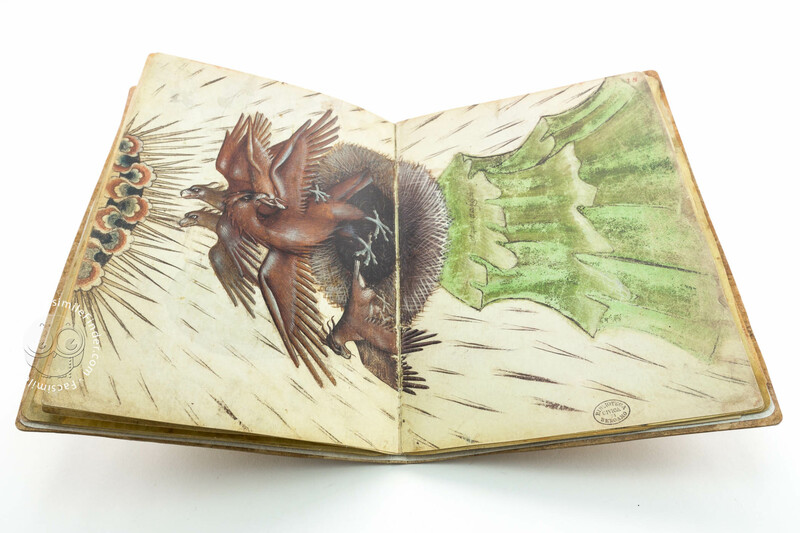 Various factors make Giovannino de Grassi’s model book a true milestone in the history of art. 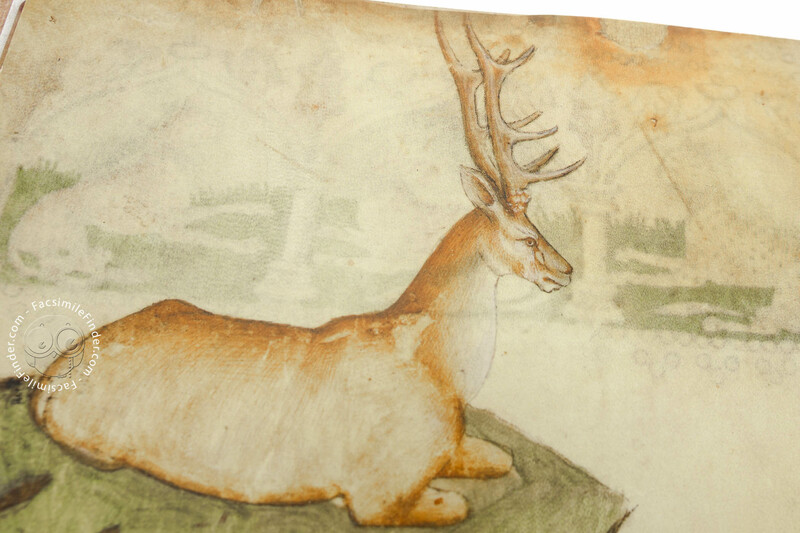 Created at the height of his oeuvre at the same time as the cathedral of Milan, it fascinates with its European orientation and its obvious stylistic relationship to other courtly centres of art. 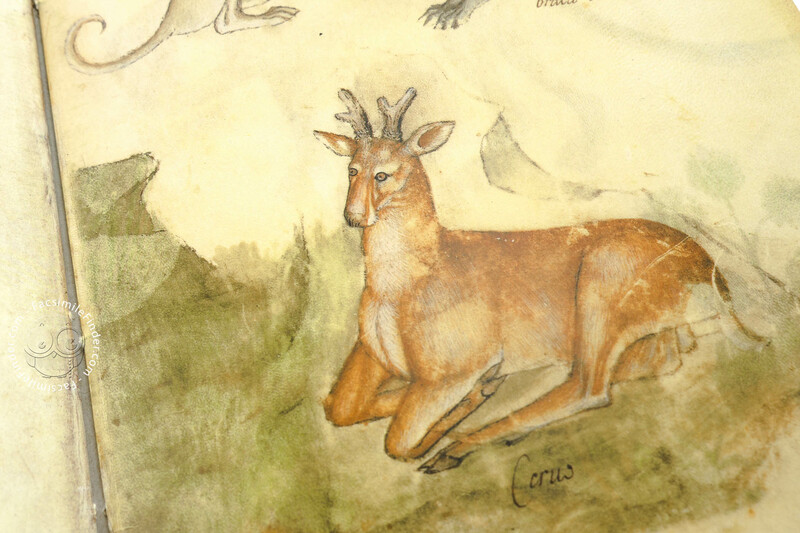 Grassi’s activities as a leading engineer of the cathedral in Milan, as a drawer, designer and sculptor of the late 14th century, distinguish him as an enormously talented and diversified artist. 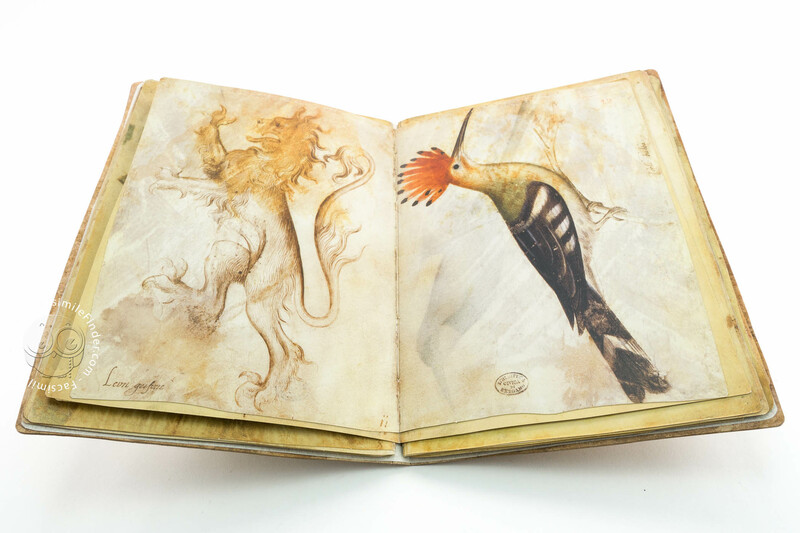 He was open to influences from other great contemporary European styles and at the same time he was a powerful renewer and pioneer of Italian art before the advent of the Renaissance. 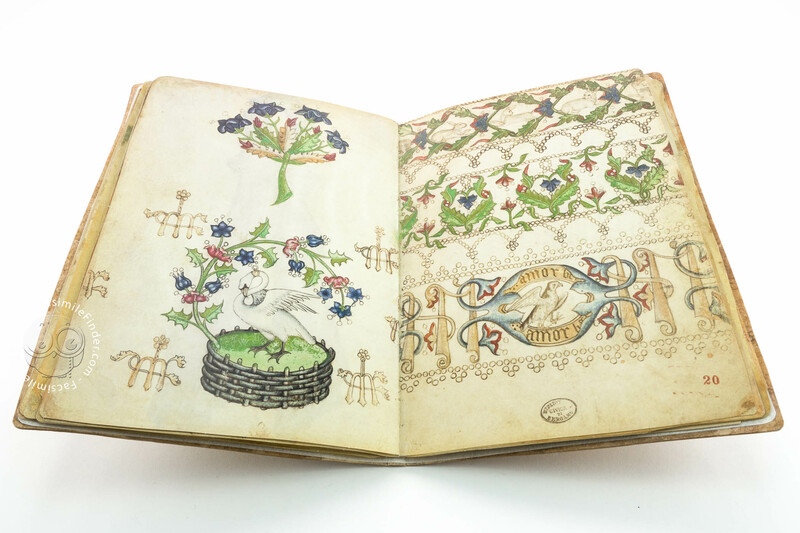 Manuscript book on parchment − 26 × 18.6 cm − 62 pp. 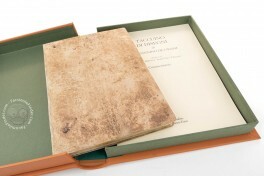 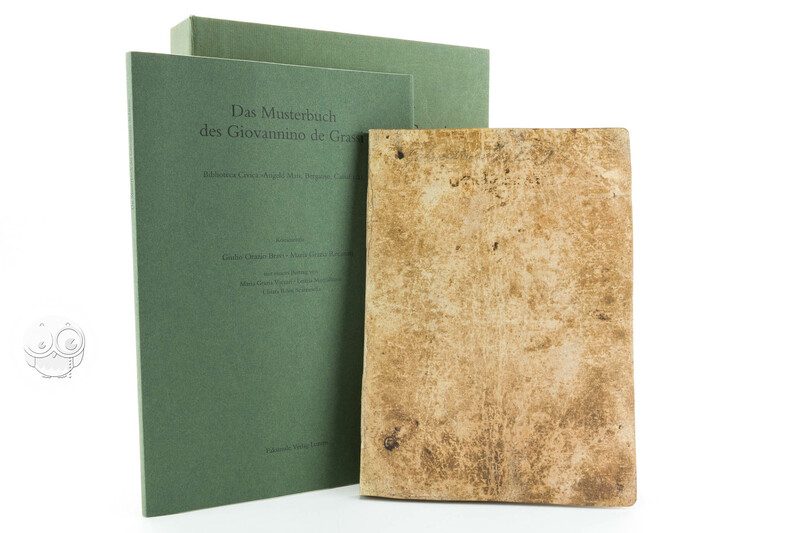 Das Musterbuch des Giovannino de Grassi facsimile edition by Facsimile Verlag. 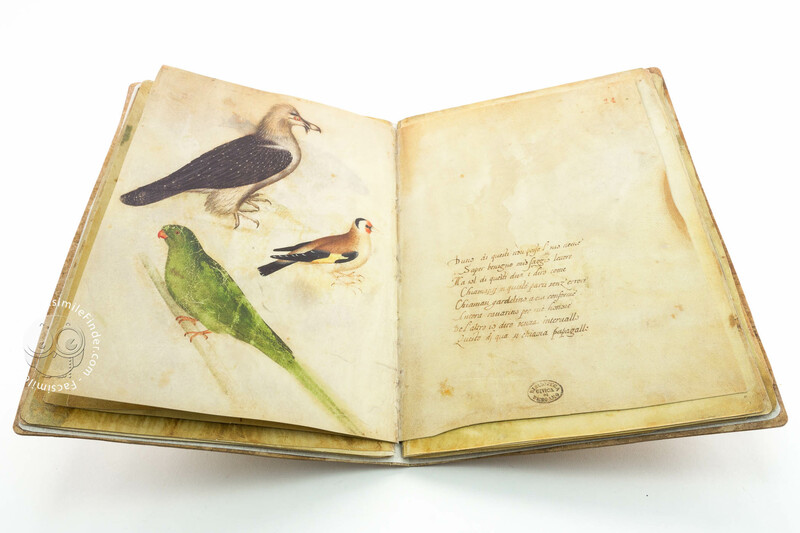 Full-size color reproduction of the entire original document, Sketch Book of Giovannino de Grassi: the facsimile attempts to replicate the look-and-feel and physical features of the original document; pages are trimmed according to the original format; the binding might not be consistent with the current document binding. 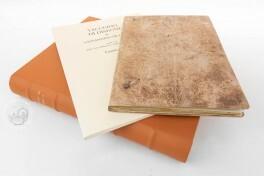 The full set, consisting of a facsimile volume in the velours etui and a commentary volume, is presented in a book case. The facsimile is published in co-edition. 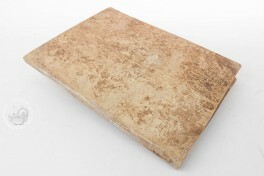 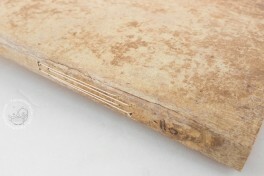 The binding is a faithful imitation of the original binding in stiff cardboard. 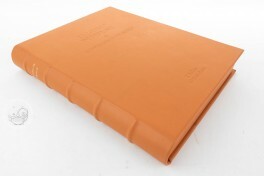 The model book is protected by an etui of the finest rust colored velours. The full set, consisting of a facsimile volume in the velours etui and a commentary volume, is available in a leather book case. The facsimile is published in co-edition.